UniTorq electric actuators offer the unique combination of a compact, efficient design utilizing proven electric actuator mechanics and the latest technological enhancements. 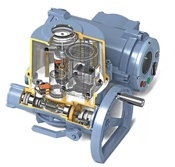 Available in quarter-turn or multi-turn configurations, these units are ideal for applications requiring different ranges of operating torque, operation times, and size configurations. Control applications can be on/off or modulating with digital microprocessor control. UniTorq electric actuators are being used in a large number of applications including oil and gas refining, power generation, chemical manufacturing, pulp and paper manufacturing, food and beverage processing and water treatment. UTM Series Multi-Turn actuator offers torques up to 405,000 ft-lbs. of torque and 1.2 million lbs of thrust. 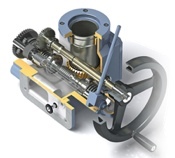 UTQ Series Quarter-Turn offers torque outputs to 26,043 in-lbs.